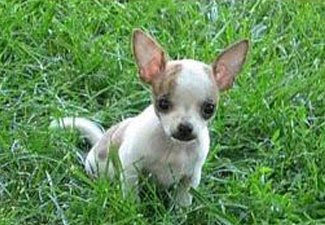 Breed Group: Toy Height: 6-9 inches Color(s): any Coat: The Chihuahua coat comes in two varieties: The Smooth and Long coat. The Smooth coat has a glossy, soft, and close coat which is full textured over the entire body, but quite scanty on the head and ears. The Long coat has a soft, longer coat that can be slightly curly or flat. This variety does have an under-coat. Either coat type comes in a variety of colors such as fawn, brown, black, and white. The coat may be solid in color, marked with splashes of color, or tri-color. They are an average shedder. Distinct feature: The Chihuahua is a very individualistic breed. They each have their own unique personality, so only a few generalizations can be made. They are commonly referred to as a "Chi". They are energetic, graceful, and display a human-like expression. Their life span is the longest of any size dog. Temperament: The Chihuahua is deeply devoted and fiercely loyal. They typically become extremely attached to one or two people. They are bold, fearless, and highly protective of their masters. They thrive on inordinate amounts of attention. The Chihuahua is by nature gentle, loving, and sweet-tempered. They are wary of strangers and make excellent watchdogs. This breed is not well suited for children or other pets. However, they are sociable with their own kind. Chihuahuas are excellent companions in the right circumstances. Activity: The Chihuahua is an excellent apartment or condominium dweller. The majority of their exercise needs can be met indoors with toys or play sessions. However, they greatly enjoy going with their owners and benefit from daily walks. Using a harness is recommended instead of a leash is best given their delicate neck and bone structure.